Rough translation of chant: "Water spirit feelings springin' round my head, Makes me feel glad that I'm not dead"
It was not given to you by your parents. This afternoon's splendid weather afforded Mrs. Trashpaddler and I an opportunity for a little 'trash pedal' in our local haunts. As usual, most of the trash was in the immediate vicinity of streams and culverts. 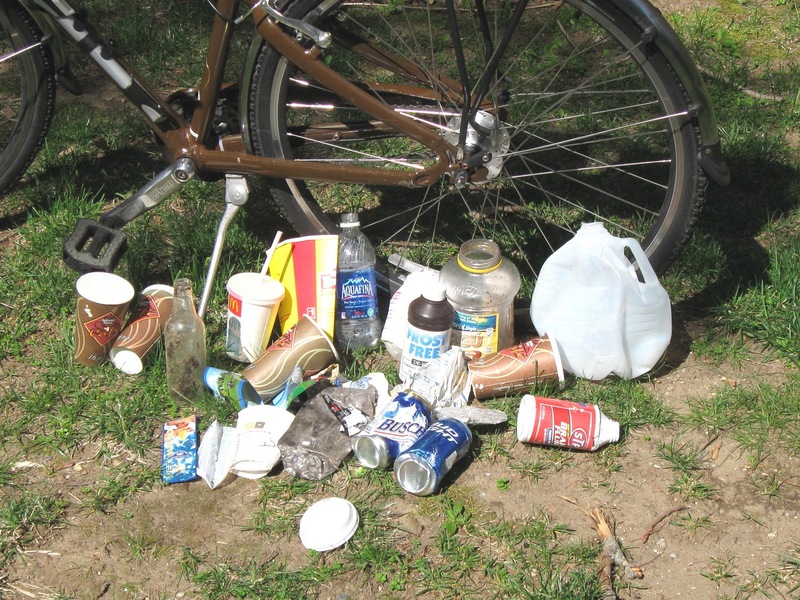 The total was a modest 19 pieces of roadside litter. The breakdown: 8 recyclable (2 redeemable) and 11 miscellaneous rubbish. Combined with an even more modest haul of 3 plastic bags while paddling the Concord River yesterday, my YTD total stands at 1802. Happy Earth Day!